The CAW2115.FC6241 TAG Heuer Monaco Vintage Chronograph Men’s Watch is part of the latest additions to the Monaco line, and was recently debuted at the Basel Fair in Switzerland. Not yet available to the public, this vintage-inspired timepiece is sure to sell quickly when it is released in November of 2010. The TAG Heuer Monaco Vintage Chronograph was made especially for the company’s 150th anniversary. 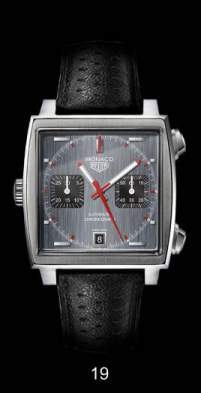 Its vintage style harkens back to previous TAG Heuer designs. It sports a handsome dark gray dial with a visible brushed look. Two subdials lie at 3 and 9 o’clock, and there is an angled date window at the 6 o’clock position. The hands for the subdials are plated in rhodium. Its minute and hour hands are decorated with diamonds, feature red tips, and are luminous. Fine-brushed indexes are hand-applied horizontally. All of these features are housed in a vintage PVD coated case. Other notable features of the Monaco Vintage Chronograph include its stainless steel crown at 9 o’clock, its stainless steel push buttons, and its black calfskin strap. It has a monochrome TAG Heuer logo on the dial, as well as lettering that says “Monaco,” “Automatic Chronograph,” and “Swiss Made.” Its crystal is sapphire, and it is water resistant to 50 meters.